Madeira Beach Madeira Beach, "Dream Beach Penthouse", 2 Br ...Madeira Beach, 2 bedroom, 2 bath Gulf front condo ...sleeps 4 ...heated pool... top floor unit... complex is right on the beach and across the street from John's Pass. [$1300-$1600/wk plus taxes. ] 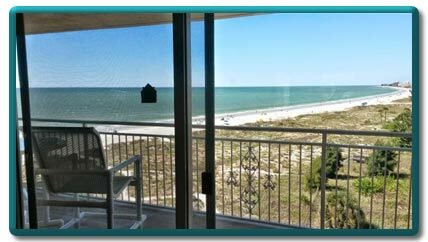 Wake up to your stunning view of the Gulf and the dolphins playing.